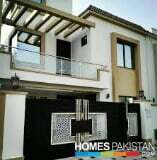 House for Sale in Sahiwal, Punjab. Asking price: 2,600,000 PKR. Bedrooms: 2. Bathrooms: 2. House for Sale in Sahiwal, Punjab. Asking price: 7,800,000 PKR. Bedrooms: 4. Bathrooms: 5. House for Sale in Sahiwal, Punjab. Asking price: 7,000,000 PKR. Bedrooms: 4.